Skateboarder’s Ankle Sprain Gets Better! At Comstock Physical Therapy we treat all kinds of folks, younger, older, and in between. We treat athletes from club teams, recreational athletes and folks with other, more unique kinds of injuries. This young man received an ankle sprain when falling off his skateboard and had a lot of pain walking an appreciable distance when he first came to physical therapy. He had difficulty even fully squatting to tie his shoes, or pick something up from the ground. He was not able to skateboard, which is his long term goal. After he started physical therapy, it was found that he had pain with squatting due to pinching and painful feeling where he actually sprained his ankle, on the outside and front of the ankle. 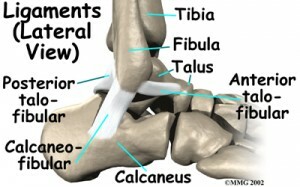 The ligament is called the anterior talofibular ligament. The ligament swelled and got pinched. After moving the specific joints to improve his ability to squat, and giving him strengthening exercises, he began to get better. His exercises inclued balance exercises on a dynadisc, theraband exercises for strengthening and range of motion exercises to improve his mobility both with his foot up in the air (open chain exercises) and with his foot in the ground and him in the sitting position (closed chain with partial weight bearing). Here it is: the fix for shoulder blade/scapular weakness on one side that makes progressing your P90X workout, or any upper body workout for that matter, harder. If you follow the above links you will see how to strengthening one-sided shoulder girdle problems. When the shoulder girdle is weak, it can cause winging. If it is just a little weak, like it is with this lady, then you may have headaches, because of the stretch to the upper trapezius. You might also develop rotator cuff impingement due to this problem. How do you develop shoulder blade weakness? Usually it hppens because you might have an arm injury, which can make your muscle weak as they try to protect you and stop you from using an injured body part. Other causes can be prolonged computer use in which your arms and shoulder are held in the shoulder forward position.